Ambode’s Face-Saving Presence At Osun APC Mega Rally: Too Little, Too Late!, By Adeoba MichaelsOnly a naive political observer will not decipher the mission of the embattled outgoing governor of Lagos State, Mr Akinwunmi Ambode at the Osun APC governorship mega rally in Osun today. Ambode was not there to rally support for Gboyega Oyetola, the party’s flagbearer but rather to try his luck if the cul-de-sac on his re-election bid can be averted. Is it not astonishing that a governor whose image loomed larger than life could take his wife along with him to Osogbo ostensibly to beg for forgiveness. The last minute efforts of the governor to create a false impression of a Comrade and a committed partyman was little and late too. Governor Ambode had missed not a few critically rallies in the south west region in the past. Without any tenable excuse, Ambode was conspicuously missing at the grand finale rally of the APC in Ekiti and was nowhere to be found at the flag off of Oyetola’s rally about two weeks ago. The governor should be reminded that he had lost gold opportunities to save his crown. Governor Ambode should know that what was bound in Lagos cannot be loose in Osogbo. What miracle is he expecting at this eleventh hour when gate had already been shot against him and another man had been anointed to takeover his throne. Who will beg for Ambode in Osogbo? Is it Rauf Aregbesola he reportedly treated like a trash when he visited him at his office in Lagos. I am sure the arrogant and vindictive governor is not expecting the bellwether minister, Babatunde Fashola that he humiliated publicly to intervene for him. The Lagos elders who could have helped him in this challenging time had been insulted by the governor. Respected Musiliu Smith and Chief Femi Okunnu had a nasty experience while trying to save Ambode’s head from hammer. If Ambode is a good man, while is he suddenly deserted by so-called supporters, not even a single commissioner in his cabinet had spoken in his support so far. The reason is simple. He has been treating them like slaves. They dare not challenge his position on issues during Executive Council Meetings. They have no powers to act. They were just occupying space as lame ducks! How many Ambode’s commissioners can Lagosians recall their names offhand. This writer can only remember three. They have all been muzzled under the reign of terror of the emperor. That was not the case during Bola Tinubu and Babatunde Fashola administrations. Average Lagosians can reel out the names of star commissioners like Muiz Banire (Environment), Kayode Opeifa (Transport), Wale Edun (Finance), Ben Akabueze (Budget and Planning), Kadri Hamzat (Works) among others. The reason was that these great talents were allowed and empowered to explore their potentiaties for the overall development of the state. But Ambode’s leadership style is worrisome. He wants to be a lone star who will solely take credit for all collective feats. In their closet, Ambode’s commissioners and other aides will be gloating over the governor’s fate because they know he is not a team player. Is it the local government chairmen whose allocations from Federation account were used to build roads in their respective councils and Ambode claimed the roads as his achievements. Ambode is now a pariah because of his high-handedness and vindictiveness. He should carry his cross and face the ignominy alone. 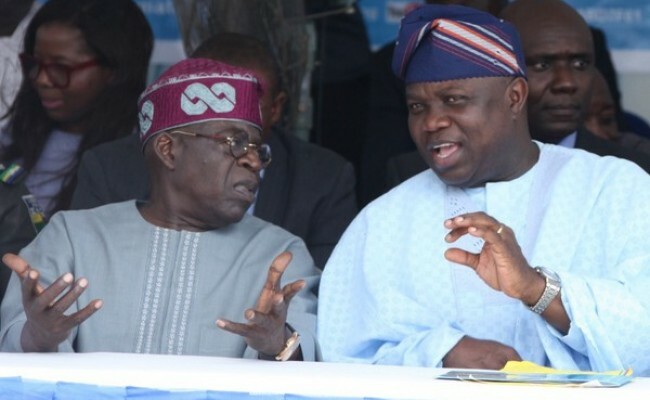 Ambode’s disgrace had started since Sunday when the preferred candidate, Babajide Sanwo-Olu formally declared. Party members and chieftains taunted him openly as a man who was consumed by greed and pride. The same disgraceful treatment was meted to him in Osogbo today, the Fuji King, K1 the Ultimate failed to recognize him when he waxed melodious songs for dignitaries. What a shame. Ambode crashed from being an Alpha governor to a pariah! He should stop wasting his time and prepare for imminent defeat if he won’t withdraw from the direct primaries. Don’t weep for the governor. He is reaping the reward of his wickedness.